AMIR KHAN EXPLAINS BENEFITS OF PILATES AND WHY HE'S DOING IT: "IT'S GOING TO WORK FOR ME"
FLOYD MAYWEATHER COMMENTS ON ADRIEN BRONER THROWING MONEY IN WALMART: "HE'S HURTING HIMSELF...HE HAS A LOT TO LEARN"
"I think fighters hurt themselves sometimes...If you're at such a high status and you reached a certain level, you're supposed to have people going to Walmart for you. You go to places like Walmart to save money. 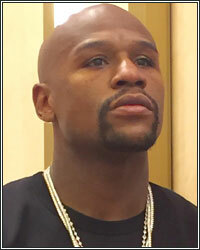 Of course you got to realize this, he's still young and he's still learning, but before you know it, it's going to be too late," stated retired undefeated former pound-for-pound king Floyd Mayweather, who shared his thoughts on the recent antics of four-division world champion Adrien Broner. Check it out! BT: Did you hear about the latest video that AB posted? FM: I think fighters hurt themselves sometimes. Someone showed me the clip of Adrien Broner the other day. He was in Walmart and what was so crazy about the video when I looked at it, it kind of hurt my feelings. The person gave him his change back, I guess he had bought something and he threw the money or the change up in the air like, "Why are you giving me change back? You don't know who I am?" Actually, a lot of people in the store didn't know who he was. They was looking like, "Who are you?" And then, it's so crazy, if you're at such a high status and you reached a certain level, you're supposed to have people going to Walmart for you. You go to places like Walmart to save money. Of course you got to realize this, he's still young and he's still learning, but before you know it, it's going to be too late. I mean, I didn't really understand it. At the end of the day, he's hurting himself; he's not helping himself. He has a lot to learn. He has a lot to learn. BT: When you guys held the press conference to announce his fight with Ashley [Theophane], he didn't stick around to answer any questions from the media and left pretty abruptly. FM: You got to realize this, it's so many top media outlets in D.C. because that's where the White House is at. That's where the President lives. When you got a chance to take things to the next level when you in Washington D.C. where there's so many media outlets, you supposed to take full advantage of that. And you know, you shouldn't take nothing for granted. BT: Did it surprise you when that happened at the press conference? FM: Well, you just don't ever know what to expect with Adrien Broner. You just never know what to expect. Of course, I always want the best for my fighters first, you know. Adrien Broner is not signed to Mayweather Promotions, so when it's all said and done, should I care what he is or what is not doing? Absolutely not. As a black man, I care. From one black male to another black male, of course I care, and of course, if he had paperwork signed to Mayweather Promotions, I'm going to be like, "Yo, listen, you can and you can't do this." But like I said, he's not signed to Mayweather Promotions, so at the end of the day, it is what it is. As far as Adrien Broner, I mean, you live and you learn, you know. Me, if I could go back and do it all over again, I probably wouldn't do it no other way because I probably wouldn't be where I'm at today. By the time I was his age, I was a much bigger star. I fought a lot better competition than he's fought, you know; not knocking him, you know, because he only can fight who they put in front of him. I mean, his two biggest fights were against Shawn Porter and Maidana, right, and he came up short. I think he won a world title like, what they say, 3 or 4 times. I know he won one against Paulie Malignaggi, but I don't know who else he won a title from. When you get to comparing certain things, we just say, okay, Genaro "Chico" Hernandez, you know, a legend, may he rest in peace. We can talk about Oscar De La Hoya. We can talk about Canelo. We can talk about Ricky Hatton, a guy who was like 40-something and 0 with 30-something knockouts when he lost to me. Diego Corrales. I mean, Angel Manfredy. Castillo when he was at the top. We can go on and on. Marquez. We're talking about when they was at the top. Even Robert "The Ghost" Guerrero when he was at the top. Shane Mosley. I mean, we can just keep going and keep going and keep going. When we get to talking about accolades and what I've accomplished, the only thing I want that to be is motivation to Adrien and motivation to all the young fighters to surpass me. I want them to surpass me, but in the same sentence, it's really not contradicting myself when I speak about these guys because I want to speak from the heart. [VIDEO] BERNARD HOPKINS EYES JUNE FIGHT IN OR NEAR PHILLY; INSISTS 2016 IS FINAL YEAR: "THIS YEAR I'M DONE"
[VIDEO] AMIR KHAN EXPLAINS WHY HE USES A STEEL CABLE JUMP ROPE: "IF IT WHIPS YOU, IT CAN HURT YOU"
ASHLEY THEOPHANE PLANS TO OUTWORK ADRIEN BRONER: "I HAVE TO SET THE PACE...OUTWORK HIM AND MAKE IT A WAR"
[VIDEO] ANDRE WARD ON MAYWEATHER'S COMMENTS ABOUT RACISM IN BOXING: "I CAN'T JUDGE ANOTHER MAN'S INTENTIONS"
CRIS CYBORG'S BOXING COACH, JASON PARILLO, DISCUSSES HER CROSSOVER TO THE UFC: "SHE KNOWS SHE'S THE BEST"
JEFF MAYWEATHER GOES OFF ON DANA WHITE AND CONOR MCGREGOR: "WHO ELSE THEY GOING TO GET TO USE FLOYD'S NAME"
[VIDEO] JESSE HART HAS HIGH PRAISE FOR DANNY GARCIA AND JULIAN WILLIAMS: "THAT KID IS SPECIAL"